Family Portraits — Outdoors! 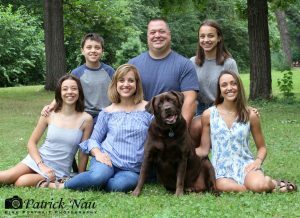 In my 37 year career I have taken hundreds of outdoor family portraits. I have had the good fortune to use the same park for more than 27 years. There are many things that make for a great park for portraits. It should be big, with a variety of backgrounds that can be best used, depending on the time of day the portraits are being taken and if it is sunny or cloudy. Another feature I appreciate with my ‘favorite’ park is that it is very private. Technically, it is not an official park. It is owned by the Park Board but there is no sign and really only the neighborhood know about it. As you can see in this portrait, it was an overcast day, which produced a very soft light. I added a small amount of electronic flash to give a little sparkle to the faces. The background I chose carefully and placed the family so they would be balanced between the 2 trees and the rich green foliage in the background. Then I used all my tricks to get a great expressions from the family dog and all the members of the family. In addition, I am a stickler for comfortable, flattering poses, I pay careful attention to the positioning of arms, legs and heads of each person in the portrait and how they relate to each other. The end result is a pleasing portrait of a very nice family in nice outdoor setting.